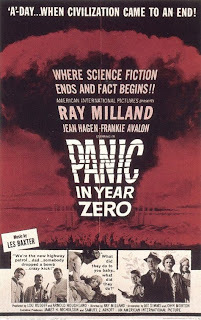 PANIC IN YEAR ZERO is filmed in black and white with an edgy jazz soundtrack and a claustrophobic vibe. A family is going on vacation when a nuclear bomb goes off. They see the cloud and don't know what is going on because their radio does not work. People are fleeing the city(Los Angeles) and looting and driving like maniacs. Lawlessness prevails. Eventually their radio starts working and they realize that all major cities have been nuked...everyone is fleeing to the country. Watch as a well-respected family learns how to fiend for itself in a lawless society and watch as even the best of men can become the most savage criminals. See for yourself the degradation of mankind, the decline of civilisation, as primitive man plots to take the wilderness for himself. Anarchy prevails. But this is nothing compared to what is going on in the major cities, where almost everyone is dead. Can mankind reclaim itself or will it fall into ruin? What makes this movie tick is that you are learning about things just as the characters discover them. A top of the line post-Apocalypse movie. Highly recommended.